TUESDAY, Aug. 23, 2016 (HealthDay News) -- Children under the age of 14 who play football are at risk of concussions, and a small study suggests that high-magnitude head impacts are more likely to occur in practices than in games in this age group. The study also found that one specific type of tackling drill posed the highest risk of head-rattling collisions in these young players. "High-magnitude head impacts are more likely to result in concussion," said study co-author Steven Rowson, an assistant professor with Virginia Tech's Center for Injury Biomechanics. It's estimated that up to 3.8 million sports-related concussions occur each year, the study authors said. And, football has been linked to the highest risk of brain injuries in team sports, according to the study. While most research has focused on high school, college and professional football players, kids 14 and under are estimated to make up 70 percent of all football players in the United States. And, those youngsters may be more at risk than older players, one expert noted. "We know that kids in general -- particularly adolescents -- take longer on average than adults to recover from concussion," said Anthony Kontos. He's the research director with the Sports Medicine Concussion Program at the University of Pittsburgh. "We don't yet know the effects of concussions on the maturation and developmental processes in the brains of children and adolescents," he explained. Rowson noted that research such as this study can help develop better prevention approaches. "And by reducing players' exposure to these impacts, concussions in youth football can be reduced." The new study hoped to understand when football players aged 6 to 14 suffer the most head impacts. To find the answer, researchers outfitted 34 players on two teams in Blacksburg, Va., with helmet devices that measure the movement of the head in impacts. The average age of the kids was 10. The researchers tracked almost 7,000 impacts. Of those, 408 (6 percent) had the highest accelerations. Tackling and blocking drills accounted for 86 percent of all these high-level impacts, even though they made up just 22 percent of practice time. "We found that impact rates between practices and games were largely consistent," said study author Eamon Campolettano. He's a graduate student at Virginia Tech. "However, teams practice significantly more than they play games. This means that players are exposed to a greater number of head impacts in practice than in games," Campolettano said. A drill called "King of the Circle" produced the most head impacts (25 to 68 per hour). "In King of the Circle, all players but one stand in a large circle," Campolettano said. "The remaining player is in the middle of the circle and rushes at a player on the perimeter. Each player gets three opportunities to be the rusher in this drill." Should this particular drill be eliminated? The rate of high magnitude impacts,"are very different than what players experience during games, suggesting it may not be necessary to practice this drill," Rowson added. What about eliminating other kinds of drills that cause head impacts? Kontos cautioned that concussions can occur at lower magnitudes than the highest level in the study. "And, there are times when very high magnitudes do not result in concussion," Kontos said. Indeed, none of the players suffered a concussion during the time of the study. Instead of eliminating tackling drills, he said, "teams and coaches can use progressive approaches to teach proper tackling technique as advocated by USA Football and other programs." "Importantly, we want to teach kids safe tackling technique with limited exposure to impacts to the brain. But it should be in a way that allows kids to then tackle properly when they play games, which are faster and involve a more dynamic environment," Kontos said. 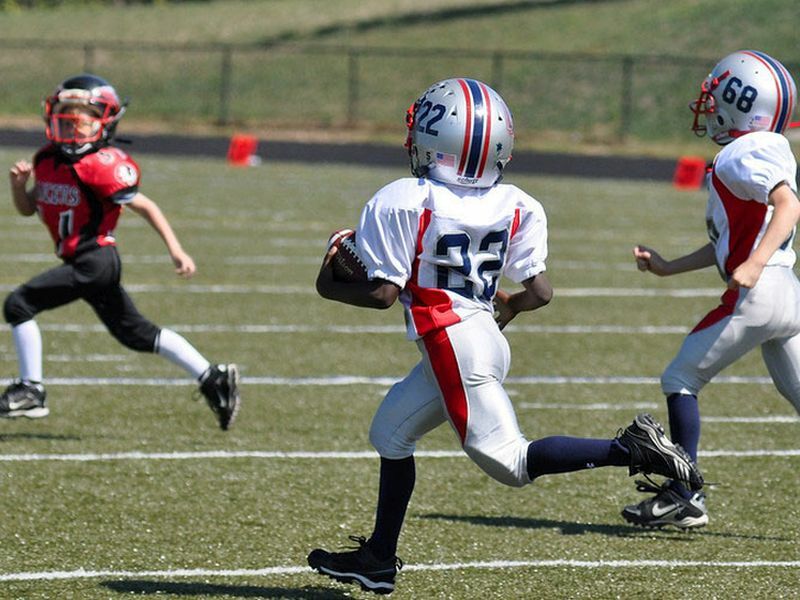 Another option is to eliminate youth football entirely or encourage parents to take their kids out of the game. But Kontos disagrees with this approach. "We need to balance concerns about concussion risk in sports with the benefits from playing youth sports including improved cardiovascular health, maintaining a healthy weight, and psychosocial benefits such as teamwork and self-confidence," Kontos said. The study appears online Aug. 23 in the Journal of Neurosurgery: Pediatrics.